One of the worst areas for planting is dry shade and yet it is a very common condition to find in your garden. So here are a few ideas for that annoying area under the trees. Beautiful silver leaves with dark green veins. This very good groundcover plant has delicate forget-me-not style blue flowers in late spring. 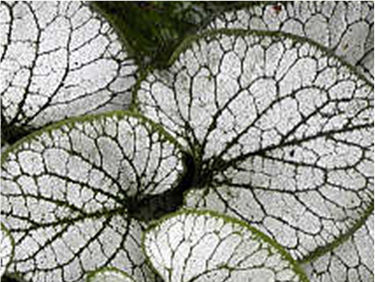 This is particularly effective when planted with ferns or Tiarella (See below). It thrives when planted in shady dry conditions. This is a great evergreen plant for dry shady areas. 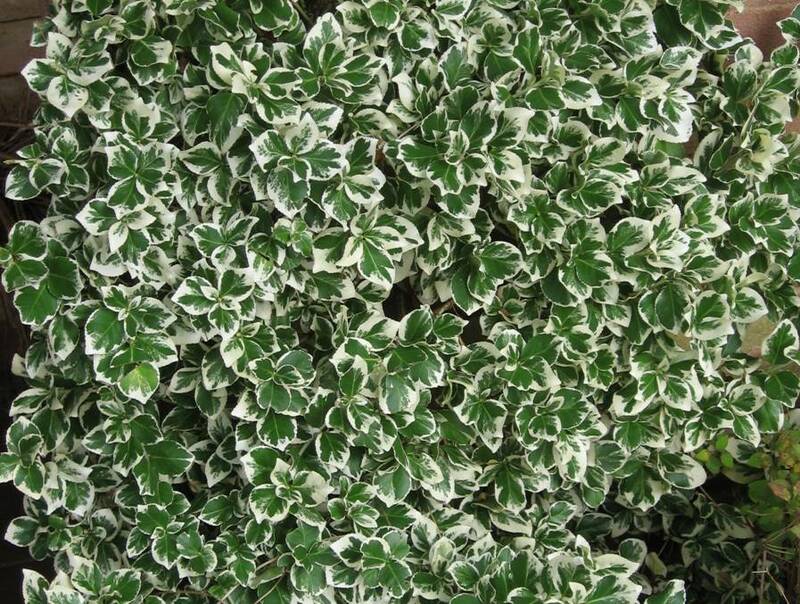 Not only will it happily ‘do its thing’ but it offers vibrant variegated foliage which works extremely well in shade. Varieties ‘Emerald n Gold’ and ‘Bright Edge’ both have contrasting dark green and bright yellow leaves which gives the impression of dappled sunlight. ‘Silver Queen’ and the smaller leafed ‘Emerald Gaiety’ offer a white and dark green variegation. These plants grow extremely well against a wall and make great screens. 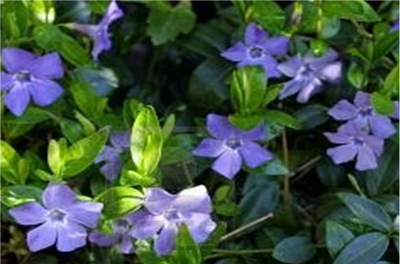 Another evergreen variegated plant is this variety of the periwinkle. A fairly vigorous groundcover plant it is an excellent plant for filling in the areas under trees. Its main quality has to be the beautiful purple/blue flowers that flower for months. Against the dark green leaves this is most attractive. Planted alongside yellow leaved plants such as Choisya ‘Sundance’ or Euonymus ‘Emerald n Gold’, this combination is very effective. 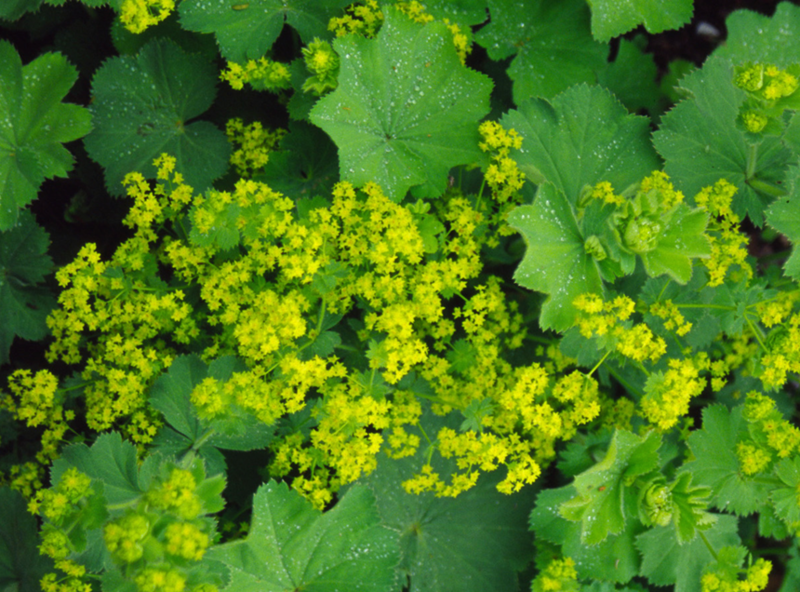 Also known as Lady’s Mantle, Alchemilla Mollis has hazy clusters of small yellow/green flowers and soft olive-green foliage that catches drops of rain water or dew along its edge which looks most attractive in the early morning sun. This plant look tired after flowering but cut it back and it will regrow fresh leaves. It works well with the purple/black leaves of Heucera ‘Obsidian’ or the vibrant violet/blue flowers of Geranium ‘Rozanne’. I never liked aquilegia. I always thought the multicoloured versions reminded me of the plastic flowers you used to get free on the back of soap power boxes when I was a child. However, the single coloured varieties are very attractive plants and are quite happy in a dry shaded bed. 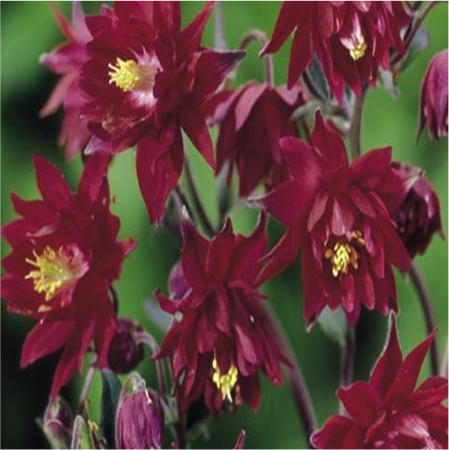 Aquilegia vulgaris ‘Ruby Port’ is extremely effective in a planting combination using deep reds and crimsons. The deep red double, spurless flowers are very effective against silver foliage, dryopteris or plant it beside the sublime Cercis canadensis where the red is picked up by the Cercis leaves. Aquilegia is vigorous grower growing up to 80cms in height and as with all aquilegia, it self seeds. 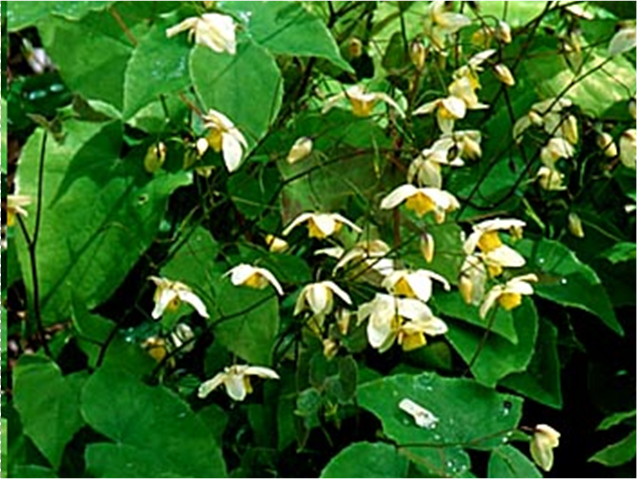 This is one of the most effective plants for dry shade that can compete with tree roots. Its small, delicate pale and mid-yellow flowers stand out over attractive red flushed foliage in mid spring. A good evergreen groundcover plant that is very hardy, although it is best that it has some shelter from direct winter winds. Commonly called the stinking iris, it has aromatic leaves that give off a mildly unpleasant odour likened to slightly rotting beef. 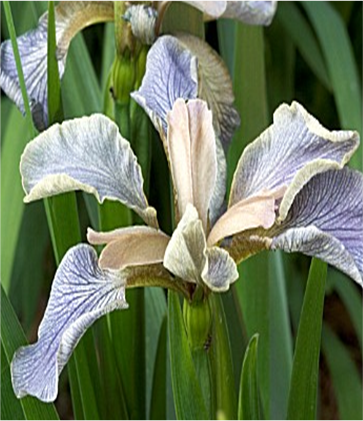 The flowers are either a dull creamy yellow or steel blue veined with darker blue. Whilst the flowers are not the most striking, the seedpods are great in autumn when the split open to reveal bright orange/red seeds that are striking well into winter. They look well if planted in groups to grow at the back of Alchemilla mollis. 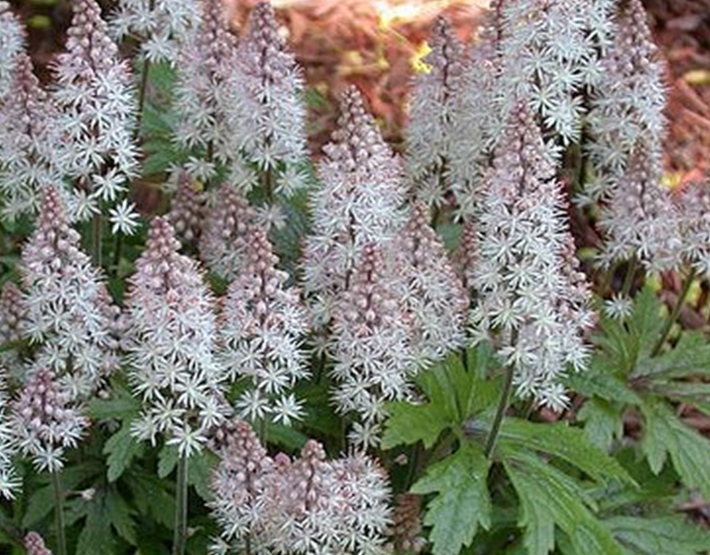 A semi-evergreen, Tiarella is a clump-forming herbaceous perennial with red-flushed, dark-veined, pale green leaves. In late spring and early summer, slender stems bearing masses of racemes of pale pink, star-shaped flowers are produced. Although very hardy, it cannot tolerate exposed areas. They also do not like being planted under conifers. 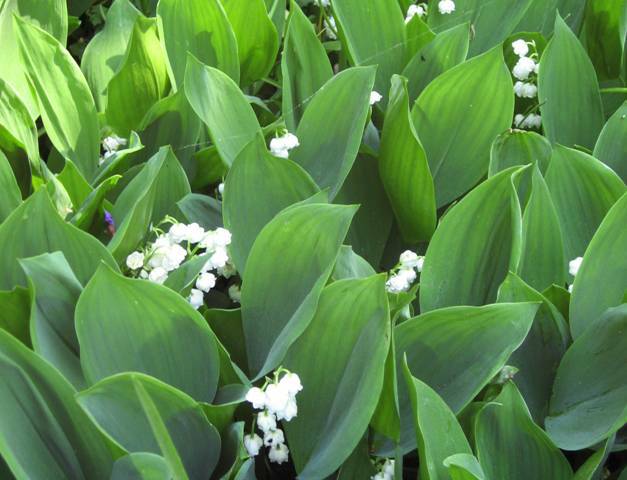 Lily of the valley is one of the most fragrant woodland plants. From late spring, it has bell-shaped, white flowers hang in arching racemes above dark green paired leaves. 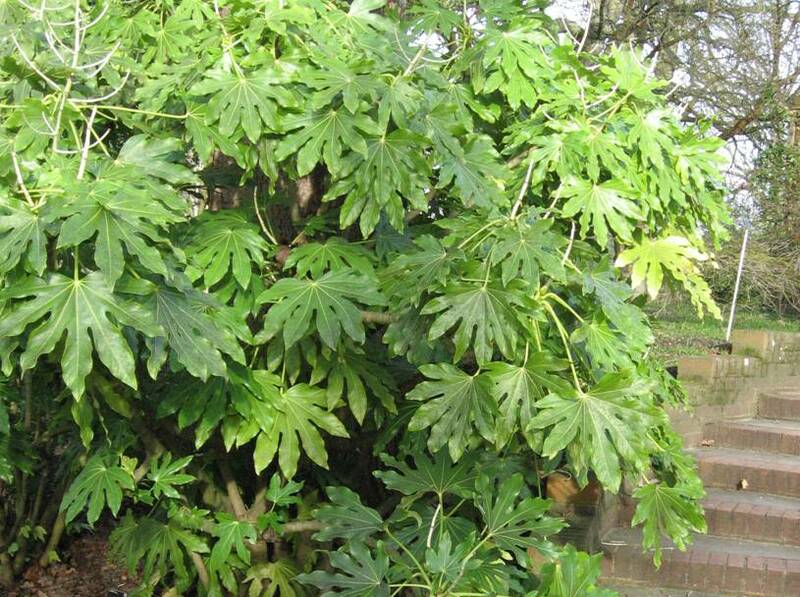 It has a vigorous spreading habit in shady areas, making it an excellent plant as ground cover in dry shady borders. The leaves are toxic if eaten. I like Fatsias. They are very attractive shrubs grown particularly for their evergreen leaves making excellent structural feature plants. They are very successful shade-tolerant plants suitable in many different locations including coastal gardens; woodland areas and against warm walls. Hard frosts can damage the leaves, but plants will recover if the roots are protected from frost. They are attractive companions to most other shade loving plants but look particularly good behind colourful hydrangeas.